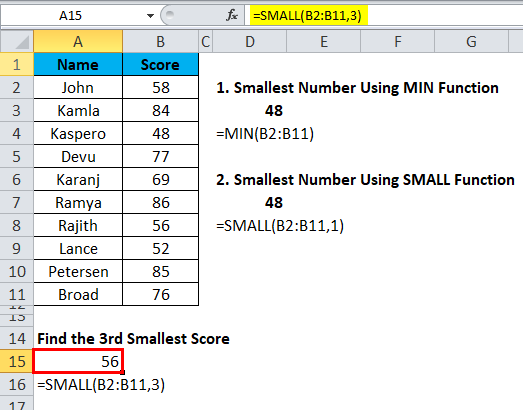 SMALL Function in Excel (Formula, Examples) | How to use SMALL? 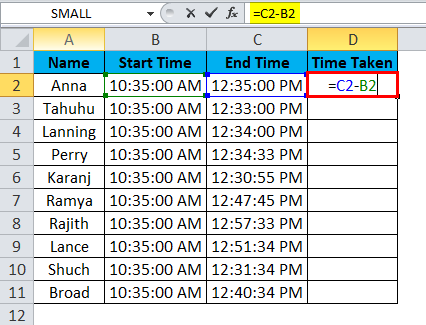 How to Use SMALL Function in Excel? As the word, SMALL itself suggests the smallest value in the list. 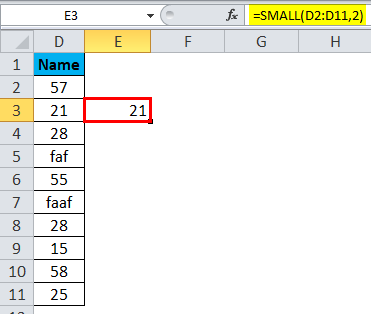 In excel we have many statistical formulas like MIN, MAX, LARGE and SMALL Functions that help us to find the minimum value, maximum value, largest value, and the smallest value respectively. The SMALL Function finds the Kth smallest value from the supplied range of numbers. 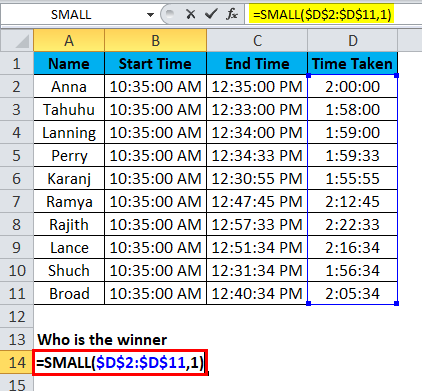 If you want to find the 5th smallest value in the list you can use a SMALL Function to get the result. For the list of numbers 15, 25, 22, 10, 8, 56 SMALL Functions will return 8 as the first smallest number and 10 as the second smallest number. The SMALL Function has two arguments i.e. array, k. Both are required arguments. Array: This is the range of cells you are selecting it as the source data to find the K value. K: This the Kth position of the number. From the list, it gives bottom value. In this function, the range should not be empty and we need to specify both the arguments. 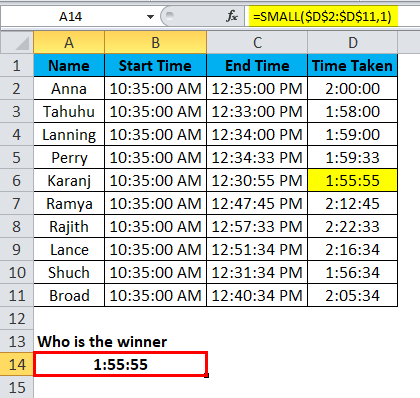 SMALL Function in Excel is a very simple and easy to use. 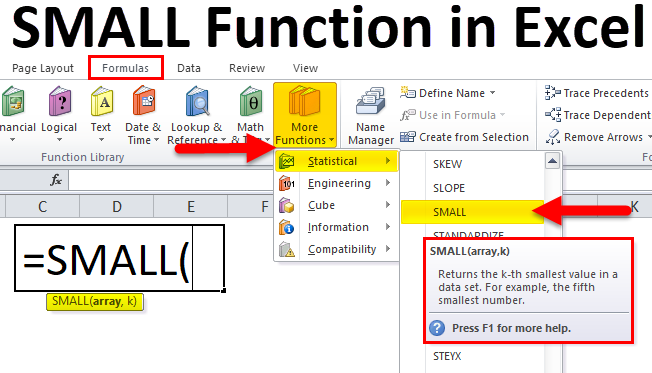 Let us now see how to use this SMALL Function in Excel with the help of some examples. 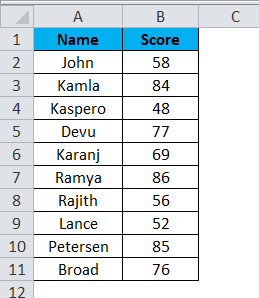 Below are the scores of the students in a test. 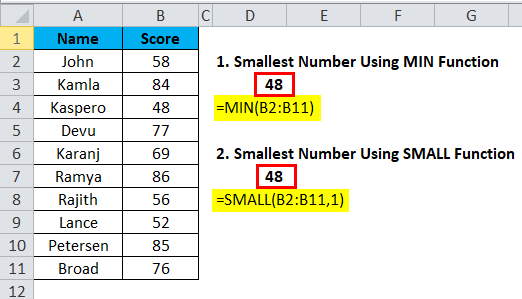 From the below-given data find the smallest score and the 3rd smallest score. If we are finding the smallest number, we can simply apply MIN Function. 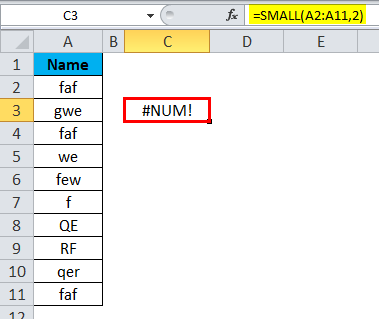 If you look at the below image both the formulas returning the same value as the smallest number in the given list. However, MIN Function stops there only it cannot find the 2nd, 3rd and 4th smallest number. In such cases, SMALL can give us the Kth position number. To find the third smallest score or number from the list we need to specify the number in the Kth argument. 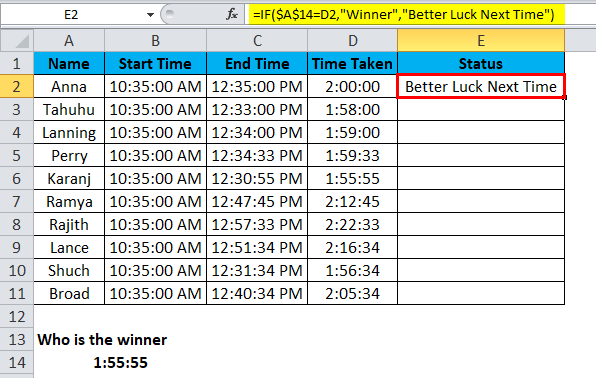 Below is the data for a cycle race. From this list, you need to find the winner. 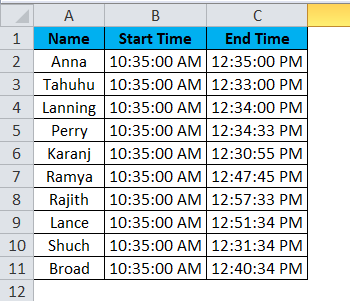 Data includes names, start time, end time. From this list, we need to find who has taken the least time to complete the race. Step 1: Find the total time taken. Actual time taken to complete the race arrived by deducting the start time by end time. 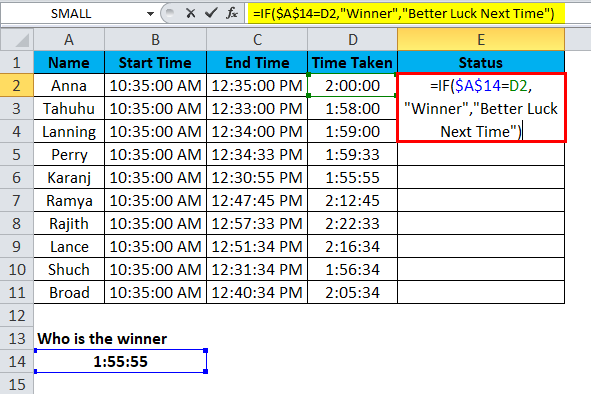 Below image shows the actual time taken by each one to complete the race. Step 2: Now apply the SMALL Function to get the winner. It is a bit of a herculean task if the list is long. But we can just name the winner using if condition. 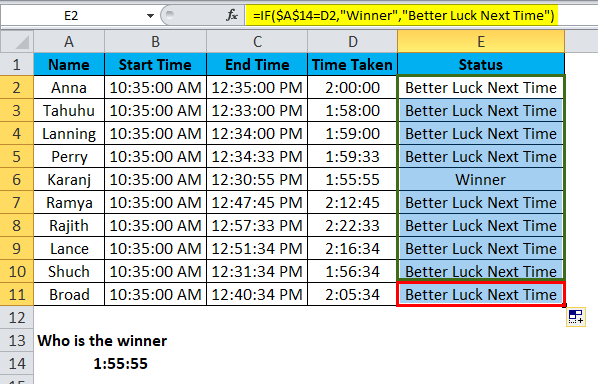 If the value arrived, by a SMALL function is equal to the actual time took value then we call it as Winner or else Better Luck Next Time. We can use the SMALL Function along with other functions. From the below-given list find the sum of bottom 3 values for Week2. 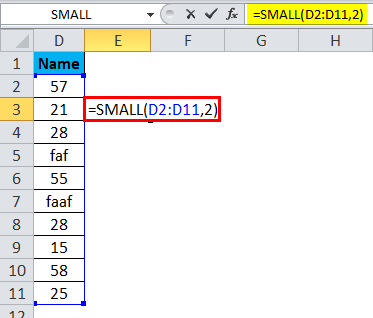 Apply the below SMALL function along with SUM & VLOOKUP function. This is an array formula. You need to close the formula by typing Ctrl + Shift + Enter. This would insert the curly brackets before and after the formula. VLOOKUP returns the value for WEEK 2 specified by SMALL function for 3 bottom values. Then SUM function will add the bottom values together and return the result as 1988. SMALL Function ignores text values and considers only numerical values. A SMALL function returns an error if there are no numerical values in the list. If there are any duplicates then SMALL considers the first value as the smaller one. K should be numeric otherwise, it returns the error as #VALUE! Supplied range should not be empty. In case of finding only the least value then we can use the MIN Function. But it finds only the first smallest value. 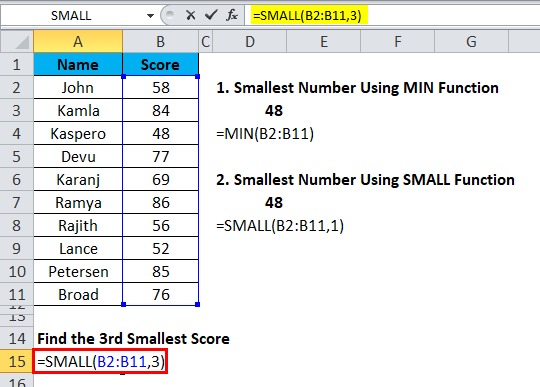 Even though SMALL ignores text values if there are any errors then it will return the result as #DIV/0!. We can use the SMALL along with many other functions to find the Nth values. Use practically to get the hint of SMALL function. 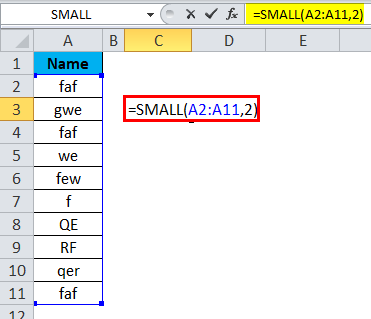 If you are using SMALL with other function then it becomes an array formula. 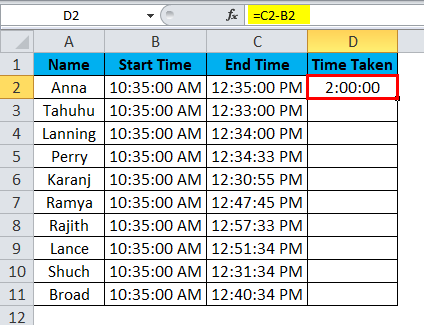 How to Use the VLOOKUP Function in Excel?